With the explosion of cell phone usage over the last few years, many politicians are turning to new ways to reach out and connect with voters and their prospective voters. Today, virtually all registered voters (i.e. those over 18 years old) carry a cell phone with them at all times. The vast majority of these phones are capable of sending and receiving text messages. This fact opens up the flood gates for reaching the general public and getting your political message out in quick, bite-sized, 160 character messages. In 2008, politicians and political campaigns began using new internet technologies to reach their voters, specifically social media, Twitter, Facebook, YouTube, etc. Today, politicians and their campaigns are turning to a more personal approach - sending personalized messages and campaign updates directly to voters' cell phones. It has been estimated that there will be 1.2 trillion text messages sent this year. The text message revolution has certainly hit critical mass and because of this text message phenomenon, it has turned out to be a boon for politicians and their campaigns. Having the ability to broadcast messages directly to voters' cell phones is the holy grail of instant communication and connecting with voters. Text messaging can be extremely effective for a political campaign, mainly because of the fact that those who choose to receive text message broadcasts have given their permission to do. This is normally done by texting a "keyword" to a short code, or local phone number in some cases. With Protexting.com, you will never be accused of "spamming" anyone. In fact, your prospective voters and constituents will be eager to receive your next message. With Protexting.com, we make it super easy to begin building a mobile list of prospective voters. We provide the short code and the keyword for you to use on websites, brochures, flyers, pamphlets, etc. Your constituents can then text the keyword to the short code, and their mobile numbers will be stored in a database so that you can connect with them at any time during the course of your campaign. With Protexting.com, you are only one text message away from personally connecting with your constituents. 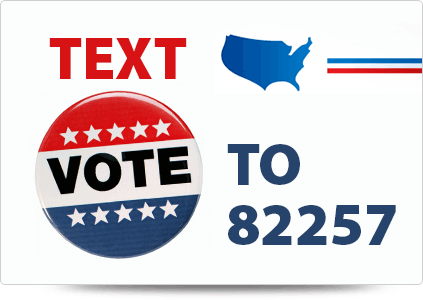 Use it for sending out real-time announcements of upcoming events, your travel schedule, or even voting results on critical issues that truly affect their lives. With Protexting.com, you will have the ability to run surveys and polls to your mobile list, providing you with instant feedback on the issues and voter concerns of the day. Want to run a drawing or contest with prospective voters? It's easy with Protexting.com! In fact, this is one of the best methods for building your initial mobile list. There simply is no better way to establish a deep connection with your constituents and voters. Text message marketing is the perfect vehicle for any politician running for, or is currently in office. Get started connecting with your constituents today using text messaging solution from Protexting.com!